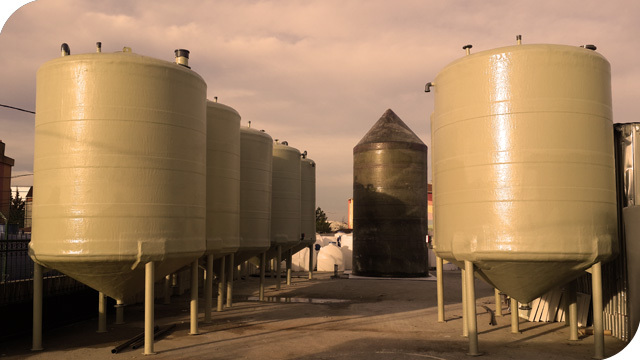 Silo tanks have 2 different production types. We can produce these tanks as fiberglass or polythene. These tanks are generally used by industrial fabric and chemical liquids production companies. Also these tanks are useful for packaging fabric. There are two different production type for poliester tanks. The first one is for acid tanks and the second one is for water. Poliester tanks’ dimensions are changable. These tanks are repairable.Even if many years later, if you have a problem, you can be repaired your tank easily. Conic part’ dimension of tank can be changed. Its height or width can be changed. Tank’ leg dimensions are also changable. In all volumes, there can be production. Location of inlet and outlets on tank can be changed. Anywhere on tank we can fix tank’ outlets. You can use polythene tanks both of acid and water. Polythene tanks can be produced to 10.000 Liter. Over of 10.000 liter you can prefer poliester tanks. Polythene tanks are less costly than the other tanks. With that advantages , there are some disadvantages of polythene tanks. The first one is the , unchangable tank dimensions. There is no chance to change inlet location on tank. Tanks should be fixed to concrete ground. Don’t use any liquids in tank except of you tell us. Don’t interfere with any driller or cutter materials. Please be careful during installing of tank. If there any problem with tank, please contact with responsives.